There are several ways in which Universities try to enhance the thought processes of students. A simple way to do the same is by asking them to think beyond the imaginable. This leads to a stimulation of their thoughts and encourages mental growth. Varied questions are needed in order to acquire different levels of thinking. 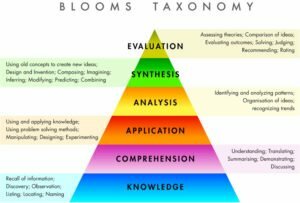 This blog Bloom’s Taxonomy Demystified provides you an insight about its different aspects. There exists a list of verbs, that is used extensively across the globe for discussing questions pertaining to Bloom’s Taxonomy. You can refer to the list when in need of assistance with assignments. 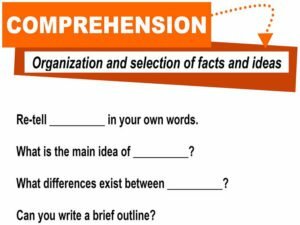 Assignment help experts state that knowledge refers to the ability of recalling or remembering any information that was previously acquired or learnt in order to incur inferences or factual answers that may be correct or incorrect as per one’s own understanding. One good way of increasing a person’s knowledge is by making it easier for him to recall things by using words like when, how, where, how many, identify, list etc. Such words and phrases stimulate an individual to extract factual answers post logical analysis of relevant information and also help test one’s ability to recall and recognize. This provides one with a lot of assistance with assignments. This refers to the ability of being able to extract inferences from any informational material available to a person. In order to promote students in comprehending in a more effective manner, it is advisable that words such as estimate, differentiate, describe, predict etc. are used. The use of such words, does not only help students convert raw information and data into valuable knowledge, but also help them extrapolate and interpret the stated facts. This aspect enables putting one’s prior understanding to practical use by implementing the acquired information in real-life scenarios. Previously learnt facts and data are applied to novel and unfamiliar situations. In order to enhance one’s application skills, it is recommended by experts of assignment help that the instructor makes use of words like demonstrate, show, solve, experiment, apply etc. These words help a student in practically demonstrating his learning of a topic and finding a radical solution to an unfamiliar situation. Theoretical knowledge is available aplenty; however, not everyone is capable of applying the knowledge gained in class to practical situations. Thus, one must constantly work towards enhancing one’s application skills. Analyzing information primarily refers to breaking information into valuable data packets such that some meaningful inference can be made out of them. The analysis could also signify thoroughly examining and processing the information gained. Using words as well as phrases like separate, explain, compare, arrange, classify, etc. helps students break information into understandable parts. Good analytical skills go a long way in helping students gain an edge in today’s era of cut-throat competition. Hence, working on polishing one’s analytical skills is a good way of outshining other as it comes handy when in need for assignment help. A pattern can be derived by combining elements of previously gained knowledge, which was not so clear before acquiring the required information. By using popular words for enabling efficient synthesis like rearrange, invent, create, what if, design, etc., students can be encouraged to observe a pattern in their findings and then synthesize the same into meaningful inferences. This proves to be helpful when you need help in your assignments. Evaluation refers to the ability to judge one’s work based on a pre-defined set of criteria, without classifying any answers as correct or incorrect. In order to help a student ace the trait of appropriate evaluation, it is recommended that an instructor uses words like assess, compare, summarize, select, conclude, measure, explain etc. The utilization of such words, does not only help an individual understand the given situation in a better manner, but also enhances his decision-making capabilities. This entry was posted in Academics and tagged analytical skills, Bloom's Taxonomy Demystified, Bloom's Taxonomy Demystified to help University Students, convert raw information, demonstrating his learning, different levels of thinking, encourages mental growth, enhance the thought processes, extrapolate and interpret the stated facts, increasing a person’s knowledge, logical analysis of relevant information. Bookmark the permalink.